NETWORK UPDATE: AMERICAN IDOL and THE BLACKLIST each gained 0.1 in final numbers, as did the BIG BANG THEORY rerun. The VAMPIRE DIARIES rerun lost 0.1. The front half of TNT’s NBA doubleheader took top honors on Thursday cable, with the late game in 4th place, both games at 1.08/0.69 substantially above last week’s 0.70/0.57. VIKINGS (History) was the highest-rated scripted show, although it fell 0.15 to 0.82, while 2 episodes of lead-in PAWN STARS were at 0.69/0.65, down from last week’s 0.80/0.72. Syfy’s WWE telecast rose 0.07 to 0.74. ARCHER (FX) rose 0.02 to 0.59. On A&E, THE FIRST 58 was at 0.55, and NIGHTWATCH was up 0.07 to 0.46. There was less 4AM audience for FISHCENTER (Adult Swim), down 0.19 to 0.40. On MTV, RIDICULOUSNESS remained at 0.52, ROB DRYDEK FANTASY FACTORY gained 0.04 to 0.42, and BROKE A$$ GAME SHOW lost 0.06 to 0.26. MILLIONAIRE MATCHMAKER (Bravo) was down a tick to 0.24. 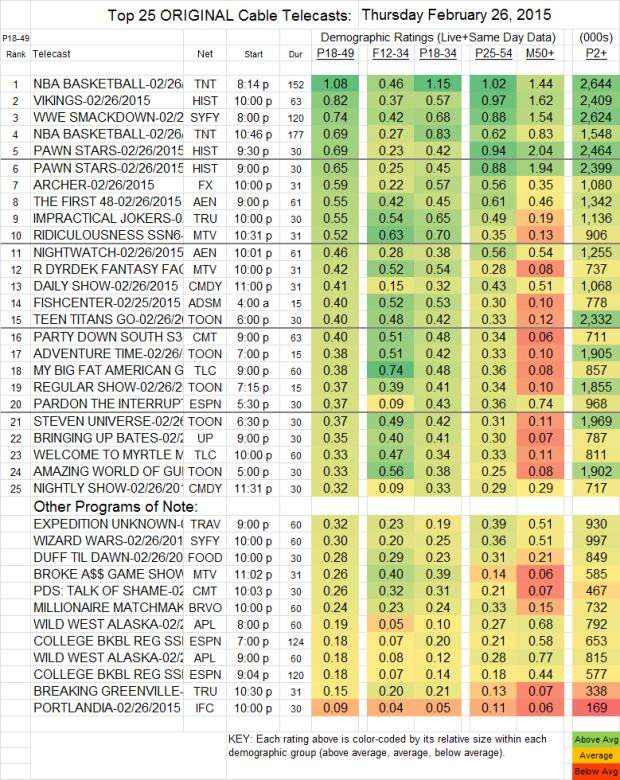 On Tru, IMPRACTICAL JOKERS was also down a tick to 0.55, and BREAKING GREENVILLE dropped 0.08 to 0.15. PORTLANDIA (IFC) lost 0.02 to 0.09. VERY BARRY BRANSON (GAC) climbed, barely, by 0.002 to 0.006, with 46,000 total viewers.